Scottsdale, AZ—Senior men’s professional golf doesn’t exactly light up the sports pages. Frankly, when the flat bellies—as six-time major champion winner Lee Trevino was fond of calling those playing the PGA Tour—are in full stride there’s scant attention paid to those 50+ years of age. But make no mistake the men playing the Champions Tour are fully capable in still achieving remarkable success when teeing it up. This week’s Senior event—The Charles Schwab Cup Championship—being played on the Cochise Course at Desert Mountain in Scottsdale, AZ is the final stop on the long progression of tournaments which started this past January. 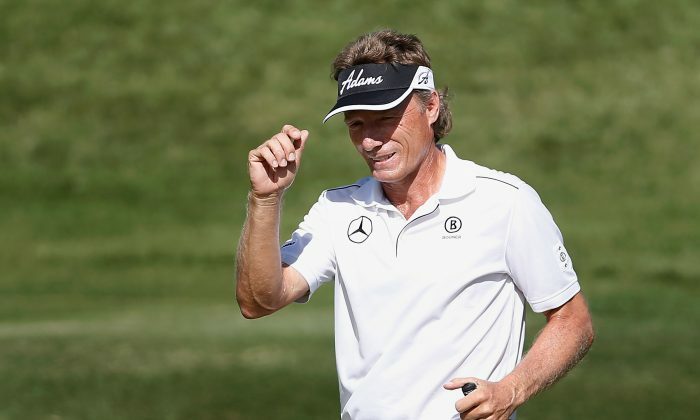 At the top of the pecking order sits Bernhard Langer. For many Americans the enduring image is his missed 6-foot putt at the 18th hole against Hale Irwin which propelled Team USA to win the 1991 Ryder Cup Matches at The Ocean Course on Kiawah Island, SC. However, to Langer’s considerable credit he did not allow that momentous moment define him and derail his career. Two years later in 1993 he would win his second Masters title and in 2004 Langer Captained Team Europe to a resounding win on U.S. soil when played at Oakland Hills just outside of Detroit. How good has Langer been since reaching 50? Since becoming eligible in the latter part of the ’07 season Langer has won 23 times—tied for 5th place on the all-time win list for seniors and captured the money title in each full year since with the exception of 2011. His play this year has been nothing short of sensational. Five wins, two of them majors—including a powerful dusting of the field in winning the Senior British Open by 13 strokes (no misprint) this past July at Royal Porthcawl in Wales. Out of 20 starts, he has placed in the top three no less than a dozen times—and has had 17 top ten finishes. Overall, Langer has won four senior majors, two of them at The Senior Open which makes up for the way he basically gifted wrap the same event for last year’s winner Mark Wiebe when double-bogeying the 72nd hole and losing in a subsequent five-hole playoff. Normally the Schwab event would determine the bonus paid to the top player from all the events played. Langer made it easy on himself—he’s assured of the money because his 2014 play has been nothing less than stellar. The defining word on Langer is simple—resilient. At certain times during his career he’s had to overcome bouts of the “yips”—that nervous twitch of the hands when attempting critical short putts has driven many competitors out of the game. Instead of retreating and leaving the stage — Langer persevered and has continued to play high level golf. At one point during this past summer Langer emerged as a possible wild card choice for the European Ryder Cup team. Before the emergence of Langer, the German presence on the PGA Tour was relegated to supplying the imported beer. Langer’s golf career caused another countryman to follow—this year’s U.S. Open winner Martin Kaymer hailed Langer as an inspiration to play professionally. What many may not realize is that when the world rankings were first announced in 1986 it was Langer at the top of the heap for a period of time. During the heyday of the European Ryder Cup team in the late 80’s through the early 90’s Langer was part of the fabulous five-some consisting of himself, Nick Faldo, Seve Ballesteros, Ian Woosnam and Jose Maria Olazabal. Although only winning three times on the PGA Tour—two of them Masters wins—Langer earned 42 wins on the European Tour. To look at Langer you see a man of modest size: 5-feet-9-inches tall and no more than 165 lbs counting the weight when wearing his golf shoes. The 57-year-old has demonstrated time and time again a relentless competitive iron will. Langer echoes the fierce determination shown by all-time great Gary Player. The diminutive South African often got third press billing when competing against the likes of Arnold Palmer and Jack Nicklaus but was than capable in winning a career Grand Slam and no less than nine major titles. The same can be said for Langer when competing against contemporaries such as Greg Norman, Faldo and the late Ballesteros. On the Champions Tour the gallery favorite is the talented Fred Couples. Langer doesn’t show envy. He simply carries himself in a dutiful manner, paying attention to what he does best—avoiding the sloppy play and putting himself into winning position time after time. Langer doesn’t engage in self promotion or any 19th hole bomb blast. As the late Ken Venturi fondly used to say when after boasting about his talents and then having his father bringing him back to earth by saying that true greatness is not about you saying it about yourself, but when others do it voluntarily. Watching Langer play is akin to German engineering: detailed, methodical and utterly precise with no wasted motions or hyperbole. In this day and age of “bomb and gouge” players, Langer is a testament to showing consummate skills with all the clubs and in never for one moment doubting what can be possible when the mind and body are so artfully engaged. What a marvelous time to hold the final event on the Champions Tour—pairing Octoberfest and Langer. Wunderbar.